If you run a business and you have the guts to try investing somewhere else, perhaps the next best thing for you is buying and selling bitcoin. The stakes are high, but if you do well, you can get rich in a short span of time. Now, how do you choose the best bitcoin trading platform? Traders consider many factors, but if they are asked about what they find to be the most important, the 4 below always top the list of answers. The site or the platform you use for bitcoin trading will have a direct effect on the liquidity of your investment. The liquidity of an asset refers to its ability to be converted into cash. It can also mean the ability to be sold or bought at its fair price. For bitcoin and the platforms that are trading it, high liquidity means the ability of a trading business to make it possible for their investors to convert their bitcoin to cash. It also means that investors enjoy robust API services and low fees in their transactions with the company they are dealing with. If people talk about benefitting from small spreads, that also means they are enjoying high liquidity in buying and selling bitcoin. Here, we are talking about tools that help traders make it easy for them to trade bitcoin. We’ll mention some. First, there are tools that allow traders to buy bitcoin fast. Example is Coinbase. By using this, you can buy in many different countries with just the use of your credit card. Another tool to consider is Bitfinex, an online tool that you can use to trade your Bitcoin for another cryptocurrency. There were issues with this site in the past due to some hacking attempts done on the site. If you will find the site not god for your business, you can always try others for this purpose, such as Poloniex. This alternative has its own issues as well, so check those out. Other tools worth checking are charting tools like Coinigy and ZeroBlock. You may also make use of tools for cold storage, such as TRezor and jaxx.io. Safety for your money is your primary concern. Since online trading platforms are susceptible to hacking, trading sites promise potential recruits that their money is completely protected with them. Some of them will tell you they do regular IT security checks. Others will convince you by saying that they give regular reports of their financial audits to customers. Some will tell you that they will put 99% of your bitcoin asset offline to protect it from online fraud. To obtain more security for your money, check if the company is fully insured. A company that’s fully-insured means that they are covered by the FDIC insurance. Check the maximum amount they cover for insurance. Traders look for the lowest bitcoin trading fees. 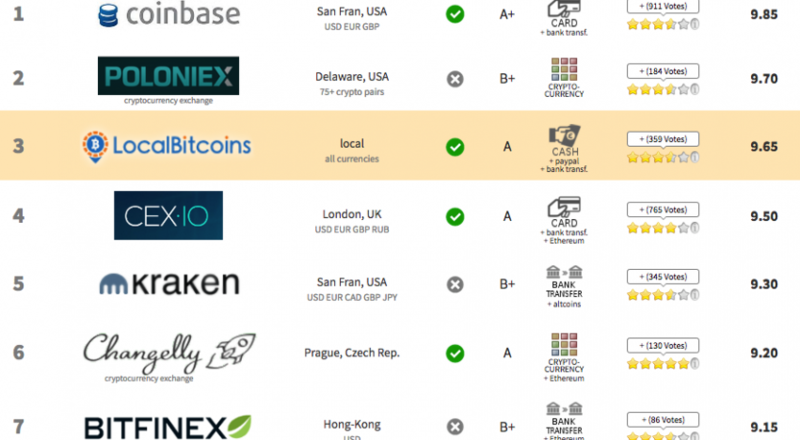 Different exchange platforms differ in their fees. For example, for a $1000 transaction, a site charges $2, $4.6 or $5. These are the maximum fees. You can get lower fees depending on your order and the amount you will be putting in. Other sites don’t charge any fees at all. You may also check the site’s maker-taker model, which is also related to fees. A maker is one who creates liquidity in the market by making an order. If the maker plays a long game, he gets rewarded with lower fees. On the other hand, a taker is someone who uses liquidity in the market and does so by matching the maker’s order. A taker therefore makes the market spread tighter. Some sites offer a 0% maker fee. For takers, the standard fee is 2%. There are special fees for high-volume traders and special accounts. Check out for those privileges, especially if you have a lot of money to put on the table. Those above are the primary factors to consider, but you can look into additional factors such as legal compliance, 24/7 professional support and the extent of service coverage. For legal compliance, you may want to check their registration in the UK and their MSB status. For coverage, it might be beneficial for your trade if the company has operations in many countries around the world and in many states in the US. Look no further than iCoinPRO’s main product – the Micro Profit System. Micro Profit System – what exactly is that? Well, it’s a combined set of tried and tested strategies to earn profit from crypto currencies regardless of the direction any particular currency is traveling in. The strategies have been tested in real time with real money by the iCoinPro experts. Early results from the testing of iCoinPro’s Micro Profits System appreciated a test Bitcoin account from $4K+ to $13K+ in one month. As a member of iCoinPRO you have access to all the strategies and all the knowledge of all of the iCoinPro trainers. The knowledge and the strategies are revealed during the weekly members webinars. All the webinars are recorded and placed in your Members Area for viewing later. Importantly, you will be able to study the strategies in further depth in your own time. There are also training modules in your back office that will take you from a newbie trader to an advanced trader at your own pace. These modules are constantly being updated to give you latest tested techniques that work. Bitcoin price surpasses $5,000 today!